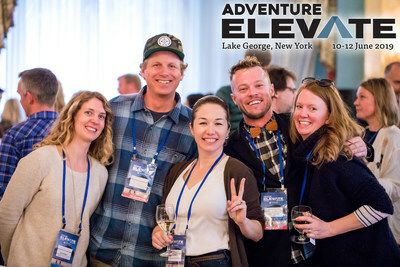 SEATTLE, Jan. 24, 2019 /PRNewswire/ -- Adventure travel industry professionals will converge in Lake George, New York, for AdventureELEVATE, three days (June 10-12, 2019) of destination exploration, networking opportunities, and informative and interactive training. Under the theme of AWAKE, delegates are invited to consider the evolving industry dynamics affecting their professional and personal lives, ultimately walking away with a fresh perspective, new connections, and a reawakening of their purpose in the adventure travel sector. The event's recently released agenda features an engaging selection of topics, including environmental protection, collaboration with outdoor recreation partners and travel agents, and finding answers in unexpected places through a fully immersive improvisational comedy workshop. AdventureELEVATE's agenda also includes built-in time for traditional media and influencer marketing delegates to participate in one-on-one networking meetings with representatives from adventure travel businesses and destinations. Located at the foothills of the Adirondack Mountains, New York's lake region is the birthplace of the North American conservation movement and a natural destination for outdoor enthusiasts for centuries. Delegates will immerse themselves in Lake George activities during the Day of Adventure, which includes hiking, horseback riding, kayaking, whitewater rafting, and cycling. In its fifth year, AdventureELEVATE is considered one of the most important and practical professional adventure travel trade events in North America. Designed specifically to address issues most relevant to the industry's North American market, the event sold out in 2018, a testament to the success of in-person connections and dedicated time for professional development. "Last year we received incredible feedback from delegates how even these few days together helps to reinvigorate their businesses and destinations. We anticipate a similar response at the 2019 event — especially with the deliberately intimate size of 250 delegates and carefully crafted sessions reflecting the theme of AWAKE," said Casey Hanisko, president of the ATTA / Adventure 360. Interested media are encouraged to apply to attend as official media. The application closes January 30, 2019. The ATTA is the leading voice and partner for the adventure travel industry. More than 1,300 member organizations including tour operators, tourism boards, specialty agents, and media share a vested interest in the sustainable development of adventure tourism. With specialized expertise in research, events, education, and media, the ATTA's business services and events division, Adventure 360, delivers strategic solutions and a robust ecosystem of global events.